For the past few months or more, I have been meaning to create a mosaic which uses cut pieces of tile mounted on their side so that I could demonstrate how a “hand-cut” smalti look and feel could be created with ordinary molded mosaic tile, which is significantly cheaper than smalti. But work and other art projects kept getting in the way, until finally one day out of the blue artist Dee Ruff emails me some pictures of her work, and they illustrate exactly what I had in mind! “We Are Stardust” Mosaic Side View by Artist Dee Ruff shows the beautiful texture and hand-cleaved look that can be had from ordinary molded tile. 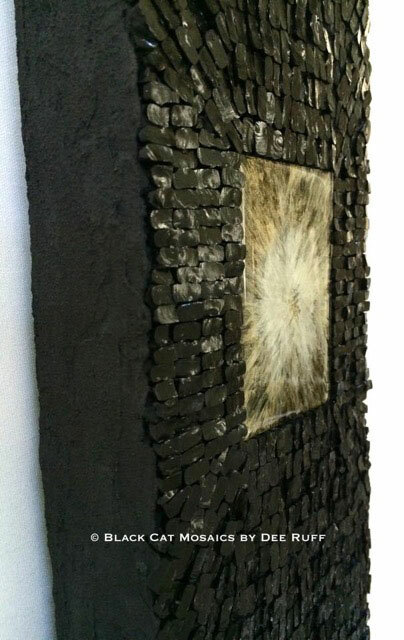 “We Are Stardust Mosaic” by Artist Dee Ruff includes a “portal” (glass panel painted on the reverse side). “In the Garden” Mosaic by Dee Ruff features ceramic figures by Atlanta-based artist Martha Coursey. “Nature” Mosaic by Dee Ruff includes a stained glass inset that matches the “color wash” gradient of the tile. Dee says “in the Garden” is one of her favorite pieces. Note that the flowers are made from ceramic figures by Atlanta-based artist Martha Coursey, who does amazing work. I like how the smooth glazed ceramic pieces contrast with the rough cleaved texture of the sky. Dee makes her panels from recycled expanded polystyrene (Styrofoam) covered in alkali-resistant fiberglass mesh and multiple coats of thinset mortar colored with concrete dye. The “hollow” core makes the substrates lightweight, and the skin of thinset and mesh makes them strong and tough (impact resistant). Dee says that she builds the mounting hardware directly into the skin so that it is anchored by layers of thinset reinforced by fiberglass mesh. Dee uses the Wedi brand of hardware, but brass picture hanging rings sold by building material stores should work, provided you use the heavier gauges. Note that no mounting hardware will be strong enough if you hang them on a nail in drywall, which is weak and fails easily. Nails or screws for mosaics and paintings of any size should go through the drywall and into the stud inside the wall (use a stud finder) or in the crown molding at the top of the wall with a hooked rod hanging down. Note the safest and most robust mounting system is probably the French cleat. See Natalija’s Instructions for French Cleat Mounting. Dee Ruff currently has work available at the The Mosaic Love Gallery in Jonesborough, Tennessee. Dee’s website is Black Cat Mosaics, and she has some interesting multimedia mosaics and collaborations online there. 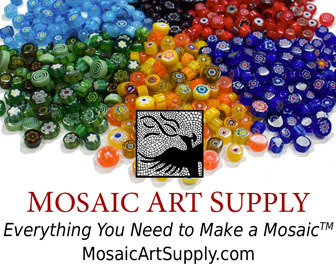 This entry was posted in Art Review, Inspiration and tagged contemporary mosaic, large mosaic, sculptural mosaic on October 10, 2016 by Joe Moorman. Congratulations, Dee. Very nice. Good to see your work being recognized! Beautiful work! I was wondering if I could use mosaic mounting tape with irregular height and shape items like rocks, etc, to assemble elements off-site? That might be problematic for two reasons. First, rounded and irregular shapes aren’t likely to stick well. Second, face mounting on tape means that all the difference in height will need to be hidden in a thick bed of mortar, and the surface of the mosaic will look like it was made from materials all the same thickness. Thanks, Joe. I do want height differences in the finished piece. I wonder if I will have to go to cheesecloth and rabbit skin glue or do you have any other suggestions? Switching to traditional manufacturing aids won’t really change the situation. The only way I have found to work with irregular artifacts is to mount them directly to the surface one at a time.